The past few days have been pretty uneventful, with the only exciting thing being a new episode of LOST every week. Even that won't happen the next week. Darn. The above photo was taken back in Singapore, at Clarke Quay, which by the way was a beautiful place. Its website also happens to have a rather funny extension - 'com.sg'. Yeah I think so, and you see waiting wouldn't have made a difference. The place looks better in the picture mate. 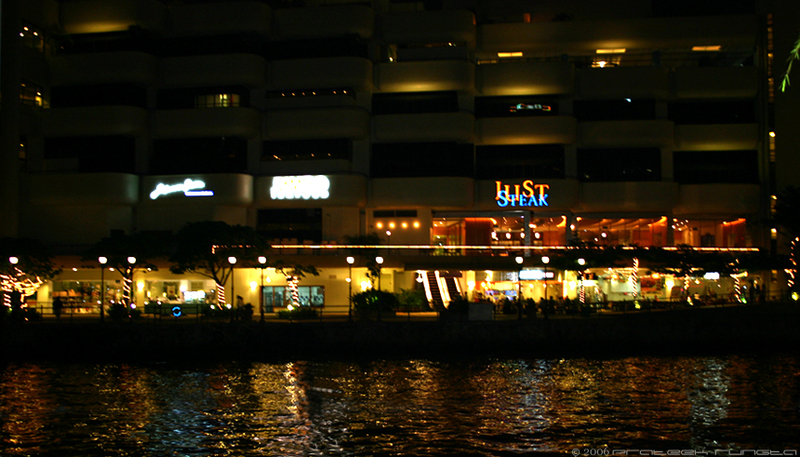 Srsly i never found Clark Quay so beautiful until i came across this picture. Really nice. Hey nice one there, but for yur kind info the extn isnt funny. Its just meant for singapore domain. Hmm u see der r certain things that say com.in dats why! So 'sg' here means singapore. Its funny not because there's a .sg which I obviously know stands for Singapore. Its funny because unlike the normal .co.in / .co.sg extensions, this one is .com.sg. hey sorry dude for such a late comment.....i forgot that i havent commented on your site. anways i have the same words......>>>the photgraph looks awesome. Gr8 Blog, I must say! Your one of the few photo buffs (don't mean anything wrong here), who actually take some good pics instead of just playing with dozens of photos. The slight hazy effect looks really good in this photo. I guess you must be using something comparable to the Nikon D70s or the Canon EOS, the best DSLRs out there. Hey also tell me what you're using to upload your blog on your server. Thanks Abhishek. Yes I use a Canon EOS 300D, and yeah it is one hell of a DSLR. As for uploading, well I developed and designed the entire site myself using PHP and MySQL. So currently I use the phpMyAdmin tool on my server to update my blog's database. Yeah, I thought so. Here too we did a lot of research before buying the D70. You should add creative-commons or LGPL as a base for your copyright. Do you use the Manual(M) or Aperture Priority(A) mode? Well I use various modes, as per the situation, although mostly its either Aperture Priority or Shutter Priority. As for the license, yeah I know I have to add one, and I also have to start displaying the EXIF data, and will do so when I get time. I think there is a problem with your archiving system. Just click on the <-- link and see for yourself. Thanks Sonika, Sumedh and Sumit. ok, I could start off by pointing out the flaws in the pic. First, when you shoot at night stop down your aperture, and get a tripod. Try to shoot at lower ISOs, the colors at night come out much more beautiful. Hello Ashwin. I guess you mistook me for a Singaporean. I'm an Indian and in New Delhi right now. Thanks for the tips, but I really couldn't have shot this one at a lower ISO or a lower aperture as that would've only increased the exposure, which would be a problem since I don't have a tripod. Hoping to get one soon, especially for night photography.